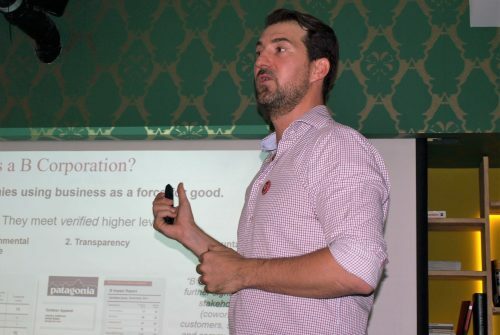 For the Responsive Organizations Jul7 25th meetup, we invited Jonathan Normand to introduce us to the B-Corporation movement principles, facts and figures. Jonathan is a Governance and Social Innovation Specialist, founder and CEO of Codethic SA (Geneve, CH), a company started in 2010 to help organizations achieve sustainable business goals. He is also Co-Founder & President of Swiss Impact Enterprise Association, and Co-Founder of swiss Crowdfunding association. A B-Corporation aims at dealing with market, building a more inclusive economy, having good organizational model, and being a responsive organization. It reward principles of organizational models insipred to Teal and Lean management built to increase positive impact in business practices. A B-Corporation is called to maximize both Profit and Social Value at the same time, and to pair with SRI (socially responsible investors). SRI are directing investment towards companies engaged in social justice, environmental sustainability, alternative energy, clean technology efforts.Investors make money and make a difference, using business as a force for good. For an organization, company or corporation, becoming a B-Corporation can help to create a positive Identity, meeting society increased demand for good practices. It may also help to attract and engage the best talents, and relevant stakeholders. Adopting a B-Corporation mindset gives protection and permission to consider non-financial stakeholders (community, employees, suppliers, environment) by the shareholders. Examples of such companies are Abhati (CH) and Fairphone (NL). An organization longing for being recognized as having a B-Corporation DNA, has to respect certain principles and values. An independent and international certification body provides independent assessment of companies, works on legislation at national level to allow the emergence of a new and legally recognized type of company, and acts as a registrar of certified B-Corporations. The first step is to self assess via a publicly available and free tool, covering questions about Workers (compensation structure, vacation days, continuing education, ownership, level of engagement, support for health and safety), Community (relationship with significant suppliers, % of management from under-represented population, % of employee paid time allowed for social services, impact on under-served populations), Environment (facility efficiency, % of renewable energy used, monitoring level of waste production) and Impact business models (direct impact via product/services, Target underserved communities, high impact supply chain). The second step is to meet legal requirements, that is to determine the path for corporate structure and state of incorporation. For previously existing organizations willing to adhere to the B-Corporation policies, there could be the need to register some new clauses in the article of association, in order to represent the B-Corporation values. The third step is to get certified from B-Lab, an NGO that conducts an independent assessment. When minimum score of 80 over 200 is reached, the new entity has to “Sign the declaration of interdependence”, and is registered as a new B-Corporation in a public database. At date of writing, there are about 50.000 companies around the world applied for B-Corp self-assessment. Out of these, 1,824 are already recognized as B-Corporations, active in 50 Countries and 131 Industries, serving about 70 M of customers. As far as SRI are concerned, it has been estimated by GSI on a trend analysis covering the period 2012-2014, that SRI investments growth was globally 61%, and it outpaced the growth in total professionally managed assets. In proportion to totally managed assets, SRI went globally from 21% to 30% in the period. Europe has seen the biggest growth in SRI proportion agains total managed assets in the periodEurope has seen the biggest growth in SRI proportion against total managed assets in the period, followed by Canada and US.